Pregnant woman “L” on her 7th month had a terrible bout of UTI. She went off of her once healthy diet and devolved into her old junk food diet. Which led to consequences… Urinary Tract Infections aka UTI. She had headaches, bad feeling all over, terrible pain under her belly, pain in her hips, white discharge, crying, screaming in pain called the neighborhood midwife / hilot to help… thought she was giving birth… the usual health center mantra told her, go get a lab test done… we suspect it to be UTI, and from there they can give you some antibiotics? Duuhhh… no antibiotics for pregnant women. Lab test blah… what for? We already suspect it to be UTI, let’s not waste time, effort or money on lab tests, let’s do something about it… NOW. Electrical medicine to the rescue… now. Enter the Mayco Zapper / Bio-Zapper Energizer. May be battery operated or connected to the AC outlet. Wonderful to zap in the car while driving… not the driver, the passenger, just use the 2 x 9 volt alkaline batteries inside. Works just as well as when connected to the AC outlet. And the best part… its almost FREE if you have a healer friend like myself. So on with pregnant and infected with UTI miss “L”. Red terminal handle on the right, Black terminal handle on the left, coat handles with toilet paper, wet with water for conductivity, turn on the Mayco Zapper to mode 1 for deepest penetration, for UTI… and sit around for 30 minutes. And PRESTO! UTI symptoms all gone in 30 minutes. SHOUT TO THE HEAVENS! UTI SYMPTOMS GONE IN 30 MINUTES! Instant healing! Your antibiotic drugs can’t do that, that fast… and without side-effects. Your herbs can’t do that… that fast. No lab test needed. The healing has been done. And just to be sure for Ms “L”, after resting for 30 minutes… zapped again for 30 minutes with mode 3 against other bacterial infections. You never know when this free healer will be available again, better take advantage of my time. Some impatient urban dweller may think spending 30 minutes sitting waiting for the zapper to take effect to heal is just too much time… well you go try being sick with UTI like this young lady for a week… to the point that she thought was was going to deliver a premature baby. Every family needs to invest in one of these Mayco Zappers (or some other kind of zappers) and keep one in good working condition at home, always have fresh 9 volt alkaline batteries in them. 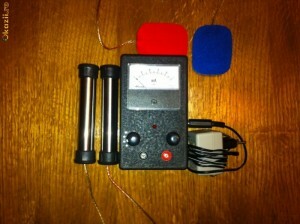 No one has to suffer from parasites, bacteria and viruses when you have one or more of these electrical healing devices. The old website www.maycozapper.com has expired, my search on Google shows http://www.bio-zapperenergizer.com is where you can buy this zapper now. I remember I bought mine from the healer Doctor Dy-Liacco. I remember paying 12,000 for this device way back in 2009. So this device I used is almost 5 years old… and it still works like magic. Only, it’s not magic, it is scientific logic. Truth in healing.